Deze begraafplaats ligt vlakbij Kemmel N°.1 French Cemetery. Het plan van deze grote Britse begraafplaats Klein Vierstraat British Cemetery. Op de grotere begraafplaatsen vind je veelal een mooie maar sobere architectuur. Hier het schuilhokje waar je tevens het register van de begraafplaats kunt vinden. Deze begraafplaats is gelegen op een helling : een zicht van achteraan naar de ingang toe. Een zicht op de begraafplaats vanuit de linkerhoek vooraan. Klein-Vierstraat British Cemetery is located 6 km south west of Ieper town centre, on the Molenstraat, a road branching from the Kemmelseweg (joining Ieper to Kemmel N331). From Ieper town centre the Kemmelseweg is reached via the Rijselsestraat, through the Lille Gate (Rijselpoort), and straight on towards Armentieres (N365). 900 metres after the crossroads is the right hand turning onto the Kemmelseweg (made prominent by a railway level crossing). 5 km along the Kemmelseweg lies the right hand turning onto Poperingestraat. 1km along the Poperingestraat lies Kemmel No 1 French Cemetery. Immediately to the left of this cemetery is a road called Molenstraat. 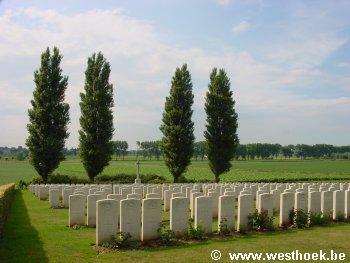 Klein Vierstraat British Cemetery is located 30 metres along the Molenstraat on the right hand side of the road. The village of Kemmel and the adjoining hill, Mont Kemmel, were the scene of fierce fighting in the latter half of April, 1918, in which both British and French forces were engaged. The cemetery was begun in January, 1917, and Plots I to III were made by Field Ambulances and fighting units before the middle of January, 1918. 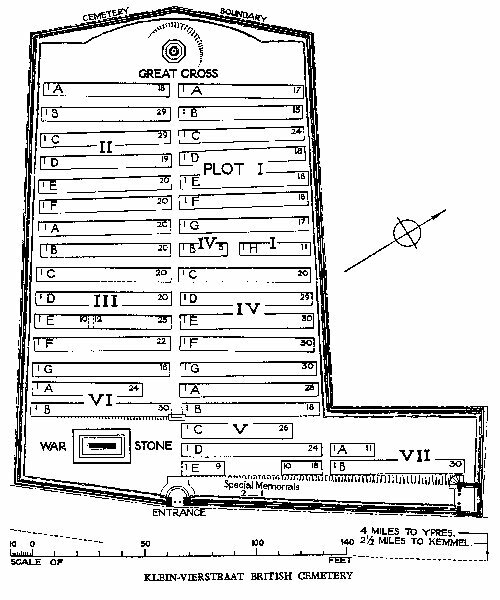 Plot IV was begun in April, 1918. Of the 437 original burials, 188 were those of officers and men belonging (or attached) to Artillery units. 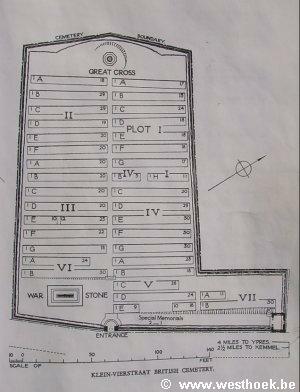 After the Armistice, graves were brought into Plot I, Row H, and Plots IV to VII, from two smaller cemeteries and from the battlefields of Dikkebus, Loker and Kemmel. One American grave was removed to Lijssenthoek. 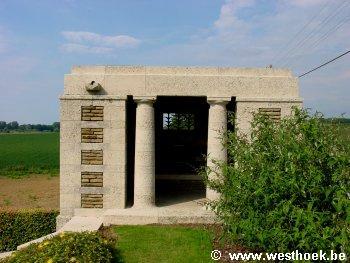 There are now over 800, 1914-18 war casualties commemorated in this site. Of these, over 100 are unidentified and special memorials are erected to two soldiers from the United Kingdom, known or believed to be buried in the cemetery. 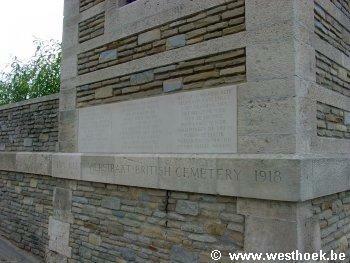 The cemetery covers an area of 3,040 square metres and is enclosed partly by a rubble wall and partly by a curb. The graves of 58 soldiers from the United Kingdom and one from Canada were brought from the Cemetery at the FERME HENRI PATTYN-VANLAERES, POPERINGHE, on the West of the road to Westoutre. 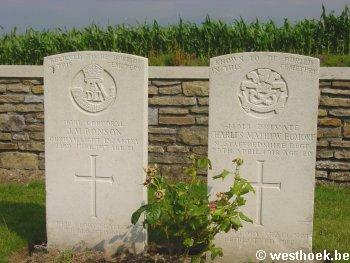 These men fell in May and July, 1915, and (in one case) in April, 1918. The graves of 17 soldiers from the United Kingdom, who fell in July and August, 1918, were brought from MONT-VIDAIGNE MILITARY CEMETERY, WESTOUTRE, on the Western slope of the hill between Westoutre and Bailleul. 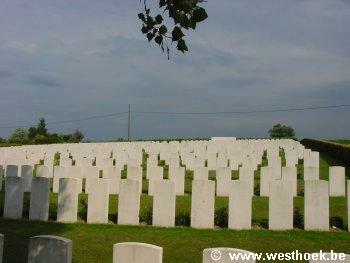 The cemetery contained also the graves of 17 French soldiers who fell in April and May, 1918.